Masks are unique cosmetic products. When we’re applying them, we feel like film stars getting ready for an important event. Mask treatment is a form of relaxation, which allows us to step into the world of our own home spa. Even though each of us may prefer a different mask, the key thing is to understand the needs of your skin. These needs may depend on the skin type you have, hormones, season of the year, diet or air quality. 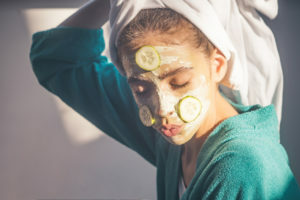 Depending on whether your skin requires moisturizing, matting, detoxication or skin tone correction, you have various types of masks to choose from, like clay masks, peel-off and cream-like masks. 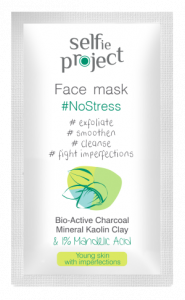 The Face Mask #NoStress by Selfie Project is perfect for young, problematic, oily skin. We called it “NoStress” because we know that stress, long-lasting worrying and tiredness negatively affect our skin. All these factors may cause breakouts and make our skin require detoxication. Thanks to its natural components, the Face Mask #NoStress is both powerfully effective and does not irritate or over-dry the skin. It contains anti-bacterial mandelic acid that exfoliates dead skin cell, and natural kaolin clay which cleanses the skin and reduces sebum production. Botanic active components of the mask absorb impurities, unclog and tighten pores. As a result, the skin does not produce excess oil, it looks healthy, radiant and smooth. The mask not only treats existing spots but also prevents formation of new ones. Once a week use is all you need. Just apply an even layer of the mask to cleansed skin, all over your face or just in problematic areas, and leave for approximately 10 minutes to dry. You may feel some tingling which is a normal sign of mandelic acid working. Wash the mask off with lukewarm water (not to irritate the skin with too hot or too cold water).